Alfred Jarry‘s absurdist play Ubu Roi takes more than a few irreverent lashes at Poland – yet judging by the multitude of Polish adaptations, Poles harbour no resentment. Staged for the first time in 1896, Alfred Jarry‘s Ubu Roi ou les Polonais (Ubu the King, or The Poles) created such a scandal that almost a century passed before it was performed again. The proto-surrealistic tale revolves around Père Ubu, a vulgar simpleton and fictional king of Poland. The action parodies Shakespearean drama in essence, although the tone bears no trace of Macbeth-esque intonation. Jarry’s genius – and downfall – relied mostly on the fantasy of his language. Ubu’s first word on stage is 'merdre', and this derivation from the expletive merde was enough to send outraged 19th-century audiences rushing for the exits. Where did a young French playwright from the late 19th century find the eccentric idea to write an entire play set in Poland? Was it arbitrary that he included the Polish kings Jan Sobieski and Stanisław Leszczyński alongside his grotesque creation? Little is known of Jarry’s life, but from anecdotal evidence we can surmise that the idea came to him from circumstances entirely unrelated to Poland. In 1888, at 15, Jarry found inspiration in his pig-like moustachioed physics teacher Monsieur Hébert, who became the prototype for Ubu. The teenage writer composed and distributed absurd short stories with the latter as the protagonist, one of which was entitled The Poles. All in all, King Ubu is a pure fantasy, albeit with some residual traces of a French schoolboy’s history lessons. It is also worth adding there was some degree of truth behind his assessment of Poland being nowhere – after all, the Polish kingdom had long since ceased, partitioned a century before by the Russian, Austro-Hungarian and Prussian empires. Ubu first appeared in the newly independent Poland in 1922. The play was rumored to be slanderous against Poland, and gradually became known to French-speaking readers, helped no doubt by masochistic curiosity. Tadeusz Boy-Żeleński’s translation was published in 1936, and with skillful rendering of Jarry’s humour perhaps contributed to Poles graciously joining in on the joke rather than condemning the play to oblivion. A new translation of Ubu Roi, by Jan Gondowicz, was published in 2006 (along with the entire Ubu gospel, Ubu Cuckolded, Ubu in Chains, etc.) proving that the uncouth Ubu still makes Poland laugh. From an artistic standpoint, Jarry’s boorish farce was nothing short of prophetic. While late 19th-century audiences found him unforgivably crude, future generations were to see in that a visionary metaphor of modernity. After World War I, several interpretations argued that Ubu was in fact a far-sighted parody of totalitarianism. Hitlerism in any form, wherever it celebrates its orgies, whether in reality or in dreams, was born from the loins of this mythical king. ...the mythical founding father of our 21st-century society. His influences ranges from the empires of Idi Amin and Bokassa to the shores of the author’s country and into Central Europe, and up to Kim Jong Il’s kingdom. This Ubuesque ambiguity not only led to much interpretation, but also earned Jarry fond forgiveness from the nation that was victim of his slander, as the following examples demonstrate. Ubu had the honour of being adapted into an opera bouffe, Ubu Rex, by none other than the master of the modern day Polish music scene, Krzysztof Penderecki. In 1990, Penderecki – then 57, already internationally famous – wrote his fourth opera at the request of the Münchener Opernfest. Interestingly enough, the opera had a German libretto, and was only translated into Polish in 2003 when another enfant chéri of Polish arts, theatre director Krzysztof Warlikowski, staged it at the National Opera in Warsaw. Another version of Ubu Rex directed by Janusz Wiśniewski at the Opera Baltycka in Gdańsk also premiered in 2003. Renowned Polish graphic artist & animator Jan Lenica took on the entire Ubu cycle to create the outstanding animated film Ubu et La Grande Gidouille (1979). Lenica’s adaptation of Jarry’s dialogues won him countless fans. Another Ubu, by Piotr Szulkin, appeared in 2003, this time based on Polish reality. Szulkin worked on the film for over 10 years, during the most difficult years of the transition to capitalism. Accordingly, the film presents a critical portrait of post-communist Polish society in which Ubu declares war on Russia. 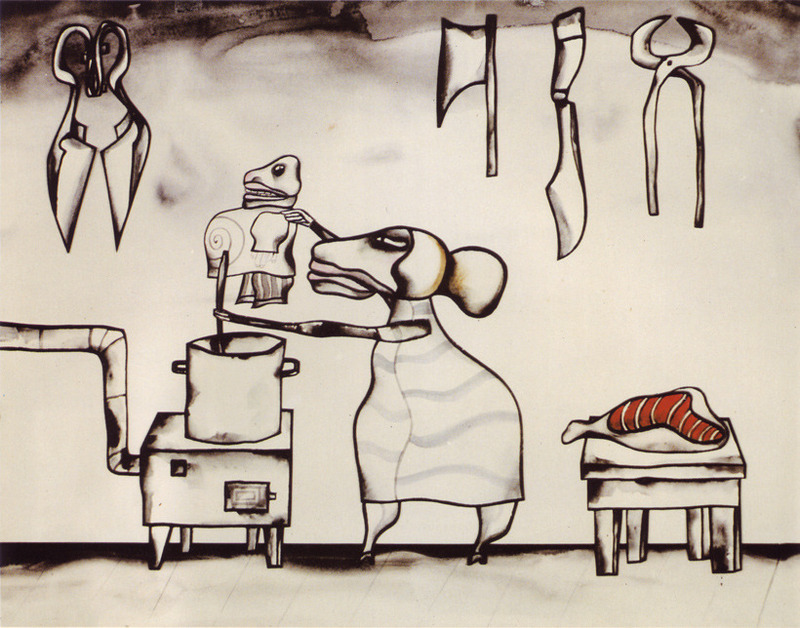 Warsaw-born painter Franciszka Themerson used Ubu as a leitmotif throughout her illustrating career. In 1951, Gaberbocchus Press – a publishing house founded by Themerson and her husband, Stefan – published the first English language version of Ubu, illustrated by Themerson. The latter also designed masks and puppets meant for Michael Maschke’s 1964 staging of the rotund monarch. In 1970, she published a comic book entirely dedicated to Ubu. The book comprises 90 drawings alternating pencil and ink, creating an impression both majestic and primitive – which befits Ubu perfectly.